Disclosure: My family and I will be receiving complimentary tickets to the game in exchange for this post. Opinions, as always, are 100% my own. One of the challenges of having kids with huge age gaps like I do (27, 16 and 11), is finding fun family things to do that appeal to the whole family.. A few years back we attended our first Harlem Globetrotters game together and we were all instantly drawn to the energy, humor and excitement of watching the Harlem Globetrotters live and we always look forward to seeing them whenever they make a stop here in Philadelphia. 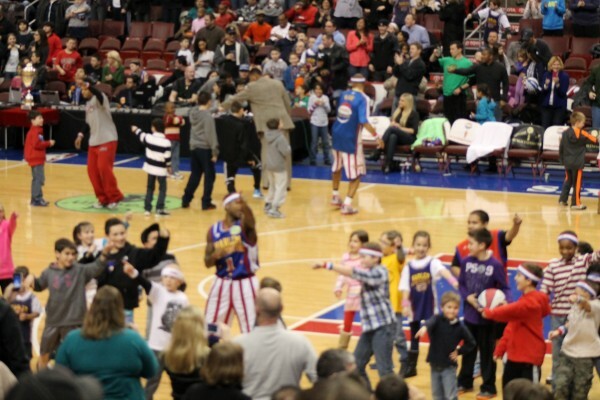 With new tricks up their sleeve and a fan powered show that is always nothing less than awesome, the world famous Harlem Globetrotters will be returning to the Wells Fargo Center for their 2019 Tour for 2 shows on March 3, 2019 at 12 PM and 5 PM and we cannot wait for another fun family day out! And now for the giveaway – Who wants to go see the show? One lucky Delco Deal Diva reader will be selected to win a 4 pack of tickets to see the Harlem Globetrotters at the Wells Fargo Center in Philadelphia on Sunday March 3rd at 5 PM. Simply enter via the easy Rafflecopter form below. Winner will be selected on February 17, 2019. Good Luck! My son is 6 and hasnt stopped talking about the Globetrotters since his first time going last year. I’m so glad I saw this blog with the discount code! Ive also entered the give away! Thank you Delco diva! So fun! I have not been have always wanted to go and my kids (12 and 8) would have a blast! Thank you! I saw the globetrotters over 30 years ago and loved them! Would love to take my kids to see if they would like them too. I went as a kid and loved it! Would love to take my family! Awesome give away! Thanks you!! Fingers crossed! I would love to take my son and friends. I wanna take my friends 3 kids for a late Christmas present. Instead of Christmas gifts, we do a day together to make memories. I was laid off last year and haven’t been able to work since and unfortunately didn’t have the resources to do anything with them before Christmas, but promised we would still do something. I’d love to surprise them with this. I want to take my family! I remember going when I was young. Is love to share this experience with my kids! We saw them once as a family of 4, but my daughter never saw them! I love all the crazy, and far away, trick basket shots they can make! Looking forward to seeing this with my kids! I would love to see and take my special needs son who watches their videos all the time. My son (12) would be the most excited. He’s always loved watching basketball and always wanted to see the Globetrotters. My daughters (9 and 6) would have a blast, too.